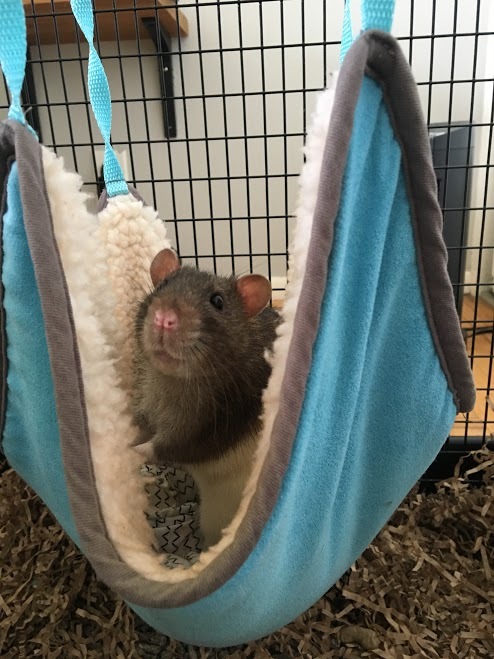 Samantha Hull is a happy rat mom who adopted her two boys through Rattie Ratz Rescue, who are located in the bay area of California. Each month KRL will be featuring a column from Rattie Ratz. I have been a rat lover since I was seven years old, when my second grade class adopted two pet rats named Boo and Bambi. Long story short, by the third grade, both Boo and Bambi came to live with me permanently. I adore all pets, but there is something about rats that keeps me coming back for more. After owning 4 pairs over the course of 10 years, I recently adopted two baby boys from Rattie Ratz this past February. I didn’t believe I was ready to own rats again. The last two I had, Stanley and Melvin, were the lights of my life and I was devastated when they passed. I’ve followed Rattie Ratz on Instagram for a few years now and when I saw a post stating they had babies available, I knew I had to respond. My boyfriend and I adopted Glenn and Gene last February. Their foster mom named all of the babies after the celebrities we lost in 2016 as these babies were born on December 31, 2016. We loved the idea and kept Glenn for Glenn Frey and changed David Bowie to Gene for Jerome “Gene” Wilder (he was so not a Bowie!). I’m always amazed at how unique rats are. 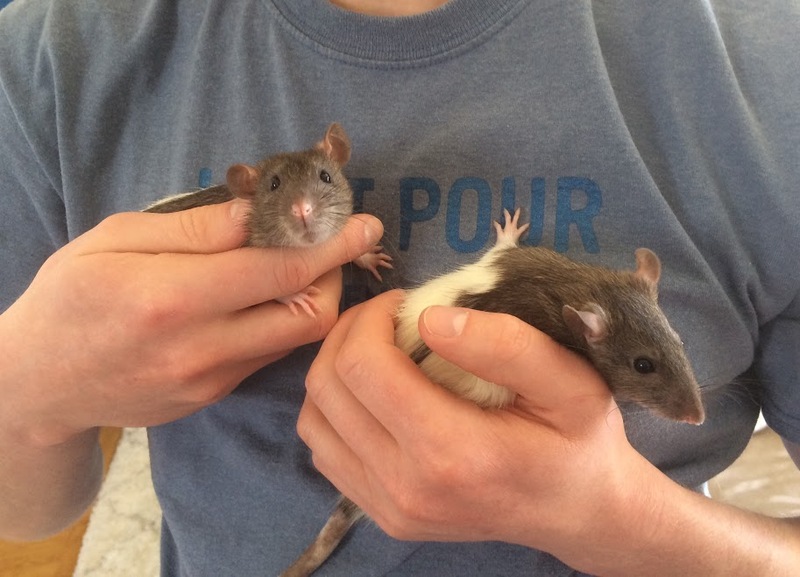 After having 8 rats, I believed I had their personalities figured out. Boy, was I wrong. Glenn is my sweet boy, a natural introvert who is only comfortable when he knows his mom and dad are the only ones in the house. He loves to perch on his “cat tree,” create a tunnel system in the couch (which he knows his mom hates), and sit with his humans as we watch TV. He is my chunky monkey. He also has one of the best karate kick moves I have seen on a rat. When his brother wants to play fight and Glenn isn’t up for it, he will jump in the air, spin, and sidekick his brother. He gives The Karate Kid a run for his money! Gene is my social butterfly that is quite the talker. Give him too many kisses and he will squeak and squeak until you let him go. I think he was the runt of the litter because he is the tiniest rat I’ve ever owned, but he eats more than his brother. Everyone always gives Glenn flak for being chunky, but the real piggie is his brother! I swear that rat doesn’t actually chew his food, but instead inhales it. Gene is also my little adventure boy, always testing boundaries. He is now quite proud to sprint into the kitchen even if he knows we are looking. He’s always pushing boundaries and loves to wrestle with his brother. Even though Gene is an energizer bunny he is also a mummy’s boy. His dad is always jealous when he sits still to cuddle with his mummy and not his daddy! Both rats have free range of the living room, they wish they could have access to the whole apartment and boy do they try to make that so. Like every rat I’ve owned, they hate every toy I buy them and prefer their cardboard boxes and my couch! 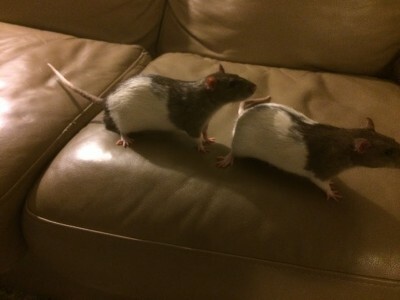 Out of all the rat pairs I own, they are the most equal, neither is more dominant over the other and they are truly each others best friends. Although, Glenn does enjoy his alone time every day. One of my main prerogatives in owning rats is sharing them with friends, family, and colleagues, especially those who have never interacted with rats before. I have converted dozens of people into rat lovers and I take pride in proving to people how lovable and social these critters are. Although they have such short lives and it breaks my heart every time I have to let one go, I can’t resist having more. I’m convinced they live such a short amount of time because their hearts and souls are so kind and wise. They are truly the highlight of my life and I will always be a rat lady. Thank you Rattie Ratz for giving me the opportunity to love my Glenn and Gene. 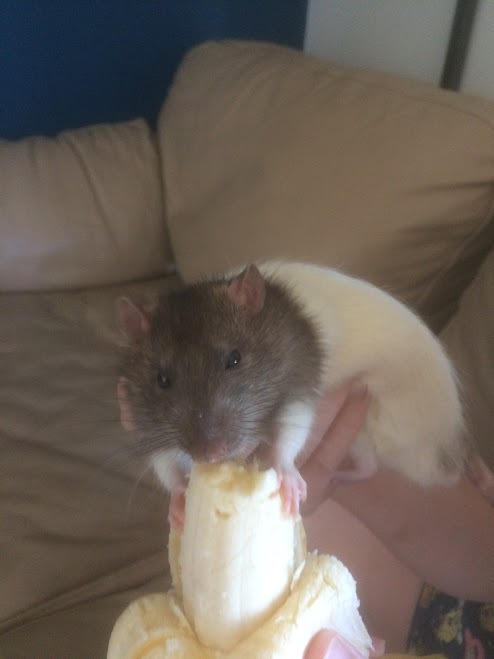 One of the reasons I love and admire rats so much is because they know how to play. Losing one is devastating and I just buried my furry friend Douglas tonight. (Who also has an article written about him here. He was playing and living his life until the very end. Rats have taught me a lot of lessons about life. Especially to let those around you know you love them. Rats are our genetic ancestors. After the last extinction, what was left was rats, which evolved into monkeys, then into apes and then into us. They have all the same brain parts as a human, just in different proportions. And of course they share or rather we share their genes. I believe they have a role in protecting and sustaining life on this planet. They make huge sacrifices.